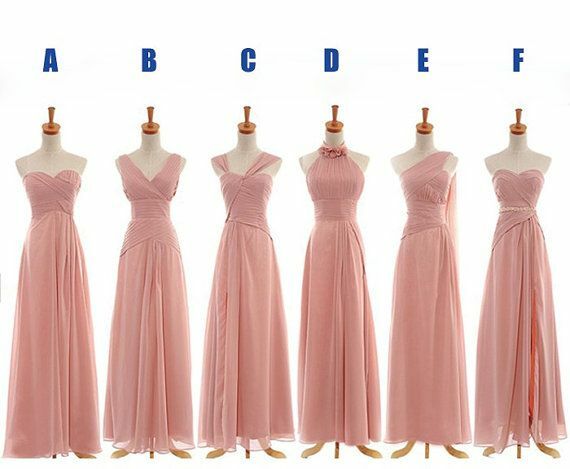 In this guide, we will discuss some of the most common mistakes one encounters while shopping for bridesmaid dresses and also discuss some ways in which you can avoid them when you are planning for your wedding. Bridal shopping starts with many decisions. Once you have selected your bridesmaids, you need to ensure that all of them are on the same page. Some girls might be very cooperative and might agree to any dress or style you have in mind. Still, others could end up being fussy or wanting their way. Naturally, as a bride, it is your prerogative to be firm about the wedding colours. However, you certainly must not be a Bridezilla or force your girls into dresses they aren’t comfortable with. The solution to this problem is: before deciding upon the style of the dresses, make sure that all the girls have the body shape and skin tone suitable for them. If required, you can also go in for mix and match dresses or convertible bridesmaids dress wherein each girl can wear a different style, silhouette or colour which suits her features. Many bridal boutiques can also help you customise dresses according to individual needs. Money is almost always an issue when it comes to bridesmaids’ dresses. Being a bridesmaid is a costly endeavour and as a bride, you should be sensitive to this fact. Many brides these days are willing to chip in part of the amount spent on bridesmaid dresses if they can afford it. Some brides are also willing to tone down their celebrations of the bachelorette party etc. The entire bridal industry in Singapore is of the cut-and-sew type. So if you are thinking that shopping for bridesmaids’ dresses is as easy as walking into a store and picking up these outfits in varying sizes, think again! First of all; not all bridal boutiques will carry the dresses you love in different sizes: you might have to customise them after getting your girls measured. Secondly, if you are getting the dresses made 6-7 months in advance, chances are that they might need alterations at the last minute. To avoid this: you must get the dresses made by a professional who can measure the ladies properly and also leave some margins for future adjustments. Another important issue encountered while shopping for bridesmaids’ dresses is coordinating with all the girls. If any of your bridesmaids resides in a far away location, you might have to decide upon a time and venue convenient to all. You could always order the dresses online these days, but the thing with online shopping is that the end product might not always be the same as you see it on the screen. To avoid this issue: you must plan things really well. If needed, only select those bridesmaids that are living nearby. This can help you avoid many potential issues especially those pertaining to bridal dress shopping, alterations etc.